I am putting together a road bike for commuting for my rather short wife just under 5 foot. She is currently running with 165mm cranks on her mountain bike and has to lift her knees too high to pedal, resulting in more work than should be required to keep up with me. 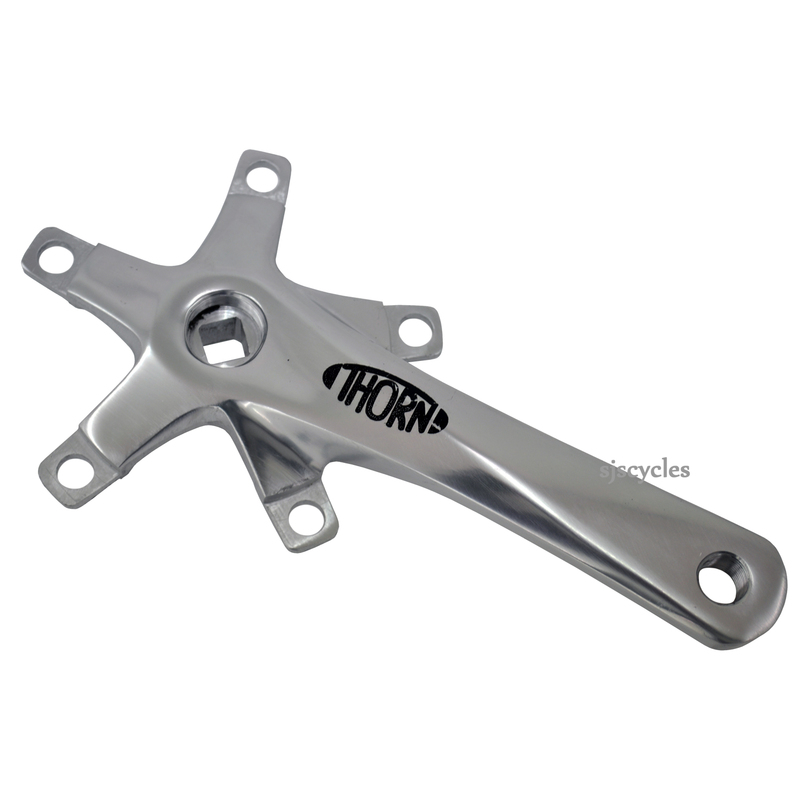 So I was looking at the Thorn Righthand Crank Spider Alloy 150mm and wondering what I would need with it to put together a triple chainset with 150mm cranks. They seem impossible to find as a set but I cannot work out what I would need to piece together a set myself. Any help would be much appreciated, and should result in a purchase of parts. As cheap as possible please as she wont even notice I bet. We unfortunately don't have a left hand crank to match this right-hand crank. We can offer our black Thorn cranks in 150mm as a pair though. These are SJSC part 31813. This crank arm you've asked the question on will not be compatible with those parts as it uses a 5 bolt chainring fitting rather than yours which use a 4 bolt fitting, the crankset I recommend in my previous reply will be compatible with all of the parts from your previous set up. Just wondering if you could help with advice on what I would need to buy to change the crank arms on my Cube LTD CLS Pro 2012 bike from the standard 175mm to ideally 150mm crank arms. The reason I need a shorter crank arm is because I have recently had a left total knee replacement and I'm struggling to get my knee to fully rotate any my surgeon has recommended having my bike altered as riding the bike will aid my recovery...I did a fair amount of cycling prior to my knee replacement, so if you can help or assist at all then that would be great. Rather than this single crank arm you've left this question on there is a different set of cranks I would recommend. I'd recommend SJSC part number 31813 as it uses the same 104mm BCD allowing for you to move all of your previous chainrings across onto this other crankset. Depending on the length of your bottom bracket (requires a 110mm) you shouldn't need to change anything else on your bike.